So you’re at the Amazon product photography stage of launching a new product? You’ve spent a lot of money sourcing your product and shipping it to Amazon. Your budget is almost all dried up. You’re debating on whether to hire a professional photographer to shoot your Amazon product photos or snap your own pics with your cell phone. Let us help make up your mind. If you don’t own a professional DSLR camera, have a lighting kit, and a clean white backdrop you shouldn’t attempt to take your own product photos. It’s just not worth all the time, hassle and potentially disastrous photos. Some things are just better left with an expert that has been snapping photos for decades. Most experienced Amazon Sellers will tell you that high-quality Amazon product photography is the single most important investment you should make when creating a new listing. It’s the one thing that allows the customer to picture themselves already with your product in their home. Now that’s a powerful thing! Something even really good copywriting has a hard time replicating. 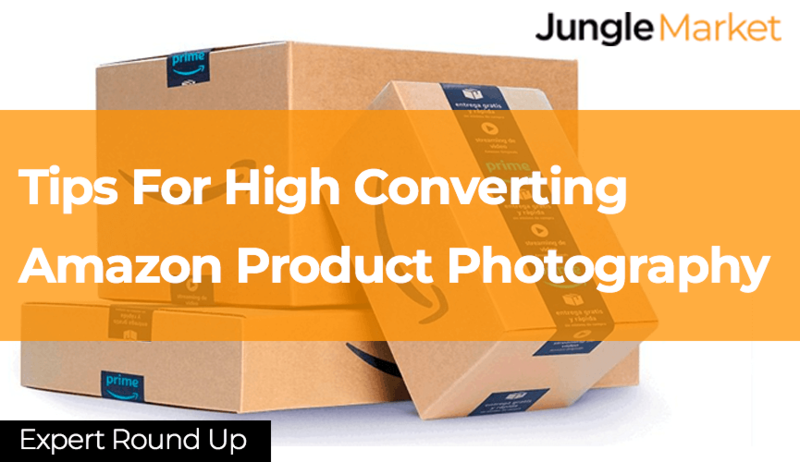 To help you on your Amazon product photography journey we reached out to 4 fully-vetted Jungle Scout Market photographers and asked them to provide some top tips for high converting Amazon product photography. In my opinion, customers decide to buy once they are confident in their purchasing decision. This means that Amazon product photography that gives customers confidence will be successful. I personally like to do as much work as I can in camera as opposed to in photoshop so that when customers see the images they have confidence that they are looking at the actual size, the actual color and the actual lifestyle usage of the product. Listings that have product shots photoshopped into stock photography intuitively feel fake and therefore don’t help build the customer’s confidence. If a seller is misleading its customers with fake photos, what else is misleading about the listing? Technically speaking only the main amazon listing image needs to be on a pure white background, all other images can be staged within an environment with props that add to the emotional connection a customer has with the product. Unless the product looks its best on white, I always recommend doing only 1 white background shot and investing the remainder of your photography budget on images with a model, texture, props or infographics. Want to find out how I do this? Ask me. The only tip I can think of is to get the best imagery you can. These days pretty much everyone and their brother thinks they’re a photographer. The result of this is an overall lowering in the quality of the imagery that’s out there on the market. Look for an Amazon product photographer with experience, and, with a portfolio that backs it up. Saving a buck or two is always a good feeling, but if in doing so you jeopardize the quality of your brand you’re losing in the long run. Take your time, look around, talk to a few photographers, and then decide. You need to stand out from your competitors because your product looks better than theirs, not because you’re the laughing stock of your market. I’ve seen quite a few shooters on Jungle Scout Market who know what they’re doing and provide great imagery. In the long run doing things right the first time will pay off much better than trying to cut corners in order to save a buck. What are some tips for high converting Amazon Product photography? There are 3 key ingredients for a strong Amazon image. Legibility is the most important. The image has to be clean, easy to understand (especially on the Amazon mobile app). Information would be the second one. Does the image convey a clear message (USP)? Style is the cherry on top. Is the image interesting and good quality? My biggest tip is to include lifestyle photography in your listings so prospective customers can envision themselves using your product in a real-life way. Customers can smell stock images a mile away, which is why our realistic lifestyle images convert so well. Storytelling—Lifestyle photography tells a potential customer a story about the product. It’s hard to connect with a product against a white background. Customers can more easily connect with a model who is gleefully interacting with the product. These kinds of lifestyle images help customers to picture their lives with the product. A variety of pictures can show different features and uses of a product. Make sure to showcase the different colors and styles of the product as well. Inspiring—Lifestyle photography can spur the inspiration of your customers. This is an especially great asset for clothing, accessories, cosmetics, and furniture. Pure white backgrounds are boring; they don’t help cultivate creativity. But with Amazon lifestyle photography, a customer gets a chance to see the possibilities of a product—how a shirt looks paired with dark wash jeans, how a sofa looks against a gray wall, etc. Even if a customer isn’t looking for your specific product, they could still come across your product listing. An inspirational lifestyle image might be enough to convince them they want your product. Lifestyle photography is also perfect inspiration for Instagram and Pinterest lovers. Explaining—Lifestyle photography can also help a customer understand a product. If a product is uncommon or unconventional, customers may need help understanding how it is used. Lifestyle images give you an opportunity to show product assembly and take pictures up close or from different angles. Lifestyle images can also give customers more tangible context for dimensions. Ready to hire a product photographer? We hope these 4 Amazon product photographers have been able to provide you with some actionable tips on how to create high converting Amazon product photography. You can hire any of these Amazon product photographers on the Jungle Scout Market if you’re looking for high converting images. These experts have helped hundreds of Amazon sellers just like yourself and would love to help you too. If there were any questions that might not have been answered in the post leave a quick comment below and we’ll try to answer it for you. If you have any other suggestions for future expert round-up posts let us also know in the comment section below.